Purchased by the Festival in 2010, the bounce house is a favorite with all the kids, young and old alike. Rides are $1 each for about 10 minutes. Wrist bands are available for unlimited rides each day at a cost of $10. Wrist band riders will get a 10 minute ride and be asked to get out and get back in line again. 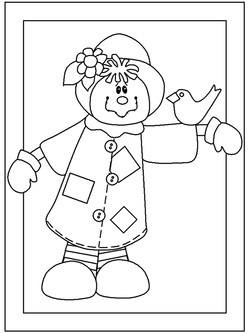 Each year during the 1st week of school, CCS students in grades Pre-K through 4 are given a scarecrow coloring page. Students are asked to color it with crayons, markers, etc. and return it to the Festival staff. These scarecrow pics are then displayed in the windows of the businesses in Canaseraga for the Festival weekend. This is a great way for the young members of our community to be involved with the Festival. You will see some of the children looking for their pictures in the windows at the post office, bank, or at Mastin's. It's a great way to display the artwork for lots of people to see.